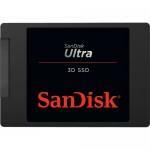 SanDisk Ultra 3D SDSSDH3-2T00-G25 2TB Expert Reviews - Read Reviews and Buy Smarter Online. Verdict: No matter how ingenious the manufacturers' R&D departments might be, a SATA SSD can only go so fast: throughput limits mean that it's only going to get harder for a SATA-based SSD to innovate. Verdict: 1TB Drive from SanDisk – one could only dream of a 1TB SSD back in the past but now it seems that it is a reality but at quite a high cost but that's the price you pay to get high-speed fast storage, especially for notebook computers when you're working on the go. Verdict: In our benchmarks tests, we managed to get a maximum read speed of around 557.8 MB/sec and write speed of up to 520 MB/sec. This is very good, all thanks to the super fast Marvell 88SS1074 controller inside. If you've noticed lately, I've started to do a lot of videos, unboxings and vlogs. Verdict: We have been nothing but impressed by both the WD Blue 3D SSD and the SanDisk Ultra 3D in today's review. Bombarding these twins with benchmark after benchmark only helped to establish their rank as some of the best performing SATA 6Gb/s SSDs out. Verdict: There are still lots of PCs out there that would take on new life with a simple hard-drive-to-SSD upgrade , and Sandisk's Ultra 3D is one of the best, if not the best SSD for the job. Verdict: The WD Blue 3D Nand SATA SSD (1TB) & SanDisk Ultra 3D SSD (1TB) provide some excellent value for all computer users, including decent speeds for TLC technology. Verdict: SanDisk's new 3D-NAND TLC-based drive is very competitive, reasonably priced, and all-around excellent. It's a safe alternative to the iconic SSD 850 EVO. Verdict: More than two years after the release of the Samsung SSD 850 EVO series of SSDs, we're finally starting to see a few challengers to its supremacy, thanks to the adoption of 3D NAND by some of its rivals. Verdict: WD recently updated its mainstream Blue line of solid state drives with new 64-layer 3D BiCS NAND flash memory. When we first took a look at the , we found it to be an admirable performer with competitive pricing. Verdict: The Western Digital Blue 3D and the SanDisk Ultra 3D give us our second look at BiCS 3 flash. The first time we got our hands-on BiCS 3, it was with Toshiba's XG5. We have been impressed with BiCS 3 on both occasions. BiCS 3, as far as we know, will be only of the TLC variety. Verdict: The Western Digital Blue 3D 1TB offers excellent performance at a good price point. The drive is within a few performance points of the 850 EVO, but it sells at a much lower price. You won't be disappointed in this choice. Verdict: The SanDisk Ultra 3D is a new client SSD similar to that of the WD Blue 3D. Because this drive is on the lower end of the performance scale, its main application will be general upgrades from an HDD-based system to solid-state technology for faster boot up times and speedier overall performance. Verdict: My 2012 late model mac mini is like new again, before it was bogged down just surfing the web. It is much better than pricing out the same thing new which came to $1950 from apple, 1TB and 16g of ram (it had 4g in it). Watched you tube video to install, took about 20 min. Yeah not a bad lower mid level drive. Verdict: Don't know what happened to SanDisk... I guess Western Digital. I have a house full of SanDisk products... but no more. I got the SSD Drive, and the cable to transfer my drive. It wouldn't work. It messed up the SSD Drive. Contacted Chat Support -- They said, go buy another software and try it. Verdict: I purchased this to replace an existing SSD and the speed improvement is clearly noticeable. In my opinion this is an excellent drive and worth consideration if you seek a 2.5 SSD. Verdict: upgrading from old samsung ssd(great p&p for 4 years).